I had the pleasure of meeting James Martin when I cooked with Jonathan Daddia two years ago and I have attended a masterclass with him at The Good Food and Wine Show. For anyone who has watched Sweet Baby James, I am sure you can relate to my stating that his desserts are worth drooling over. I have reviewed my signed copy of his book, The Collection as well as shared with you his recipe for battered hake and Swiss roll. I can tell you that his recipes really work, which you can read more about in the post I did on scones. I have also made shortbread using his recipe and it worked perfectly once I adjusted the oven temperature. Now I am able to share with you James’s Desserts. This is a tribute to the women in his life who baked from scratch. James is correct in saying that baking is all about practice and the basics. James begins by sharing his recipes for various pastries including a recipe for a simple rough puff pastry (page 13) which I made when I baked an onion tart tatin. Dave said the pastry was good, and it was so easy to work with that I will make it again and again. Other basics include a sponge, shortbread, spun sugar and various meringues, as well as a raspberry sauce and custard recipe. After the basics James moves onto the hot puddings. I have tried most of the 14 recipes but will definitely come back to the book in winter to try the baked parkin recipe (page 35) as well as the mincemeat and apple jalousie (page 47). The cold pudding section really grabbed my attention with the first recipe being for delice au cassis (page 54). Out of the 18 recipes I am planning on making the lemon curd syllabub (page 60) and the baked chocolate mousse with candied fennel (page 65) as I still have candied fennel left over from my fennel cake. There is a recipe for baked chocolate and orange cheesecake (page 72) that I am bookmarking and I might even attempt the raspberry marshmallows (page 84). The tarts and flans section has 10 recipes and the first one that I will make is the classic lemon tart (page 95) which will be closely followed by the truffle torte (page 99). But, it was to the cakes and bakes section I turned to when testing a recipe for this post. Out of the 17 recipes he lists it is the Sachertorte (page 119) that I decided would be my first recipe to make from the book. I have been meaning to make this as an accompaniment to my pickled ginger ice cream but the Larousse recipe contains a LOT of chocolate. James’ recipe seemed far more reasonable to me. 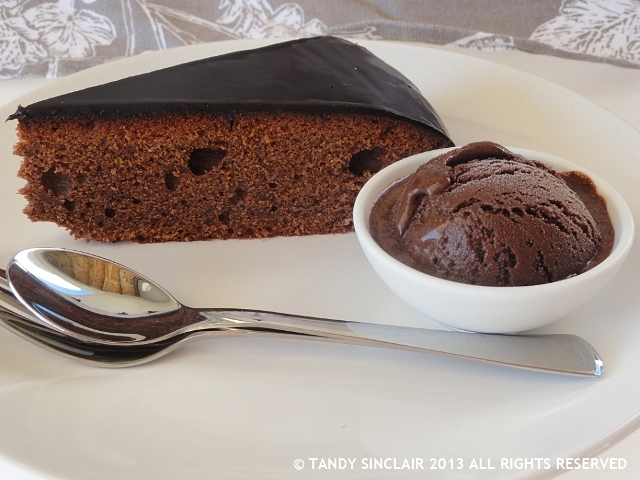 I first had sachertorte when my mother bought back a box from the Hotel Sacher for me. They make a sugar free version and twice I have enjoyed an entire torte to myself (not all in one go!). The recipe was easy to follow but I did not use the icing recipe as per the book as I still had some glaze left over from the cookathon that needed using up. This got a thumbs up when served with my sabayon. The second recipe I turned my hand to was the chololate sorbet (page 142) which is the first of 9 recipes in the ice creams and sorbet sections. Be warned, if you try this recipe you will need to exercise a lot of patience as it takes some time to gently heat the liquid until it is boiling. I changed the recipe slightly, substituting fructose for the caster sugar and at first taste I was scared it would be too sweet. This is the first time I have successfully used liquid glucose and the sweetness was tempered when I added the dark chocolate. This is a milk based sorbet recipe and the proof was in the tasting. I much prefer fruit based sorbets and would call this a diet ice cream. It is creamy and delicious and you would not know that it was made using water rather than cream. 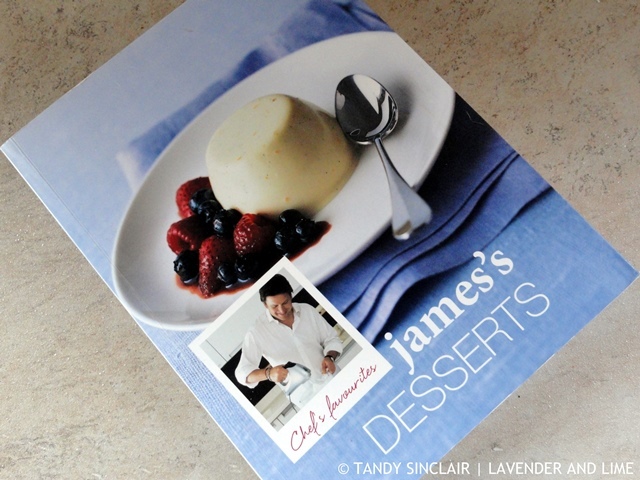 James also has a recipe for lemon granita (page 151) which I shall try as well as a 20 second strawberry ice cream (page 153) which utilizes frozen strawberries and buttermilk. Each recipe is accompanied by a drool worthy photograph and the recipes themselves are laid out in an easy to follow manner. I am definitely going to buy this book!! Loved your review! I love James martin’s recipes a lot too! He also presents Saturday’s Kitchen & I love that show a lot! Thanks for the review Tandy. 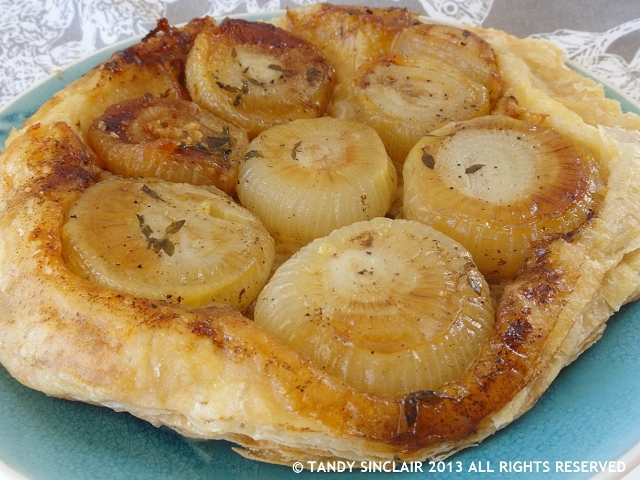 I must admit that many of the recipes that you’ve written of are far outside of my repertoire but I adore the look of your onion tart. Both recipes look beautiful but I like how your little onions look like little soldiers standing to attention. Sounds like a great book. The day after Easter I couldn’t look at another chocolate egg and promised myself I would be on chocolate free diet for a bit to make up for the chocolate overdose over the festive period. This cake would easily break the drought. It looks devine! I shall save the recipe for when we all need a chocolate fix again! You’re a lucky gal 🙂 And the result looks delicious. I love the looks of that chocolate cake! So tasty! Ooh, what a lovely slice of cake! I ahree, I like the way he cooks and his recipes really do work well. Will have to go and dig out my book! What a wonderful opportunity my friend to cook with them with delicious results! It was an different experience indeed! Who doesn’t love James Martin – he is such a honey and his food is fabulous!